It has been a rain soaked work week for me. While I am ok with the rain, my schedule is not. I am now tardy for the third time in the week and it ain’t pretty, I have somehow managed to rack up more than a couple of hours worth of tardiness. I am sure to get a memo from the office. Despite my best efforts to be early, the traffic always gets me every time. If only I can just curl up on my bed all day. Seeing this scene makes me want to crawl back to my bed. 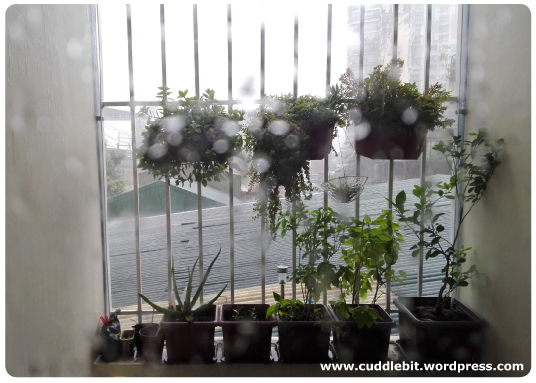 The constant rain is also unkind to my plants. Most of them are now overwatered. And just when I thought the pigeons are ok. It was only a false sense of security because they managed to destroy my hanging planters completely. The suspects – If I ever catch these two, they are going to be cooked. They tried to make it as their nest! Arrrggghh! After all those times of tending to my iceplant , succulents and spikemoss it is all bent and broken with some of the plants good as dead-as it was snapped in half. It is so frustrating and I wanted to just shoot the birds- if only I have a pellet gun, which I don’t. It’s just irritating. my plants look pitiful – The bald iceplant on the left, the snapped into two succulents in the middle, the bent spikemoss to the right. 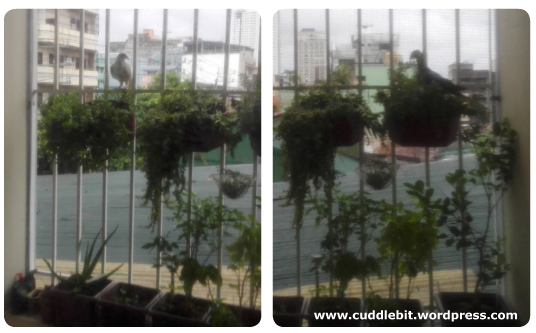 I posted my gardening woes on facebook and Matti sent over some articles about shooing away pigeons. So I quickly got bbq sticks staked to the pots to deter them from trying to nest again. This is kind of like bringing the big guns out! Hopefully this time it would do the trick. Never could have thought that garden pests could be this big (and can fly too). 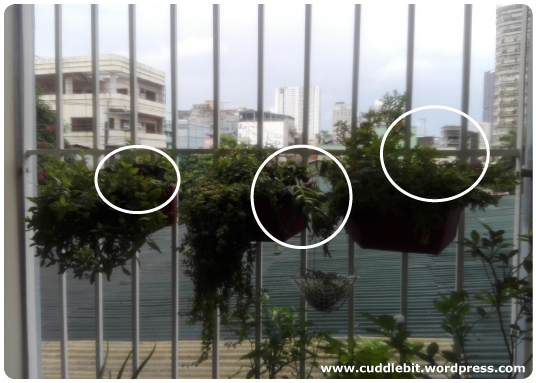 Categories: Uncategorized | Tags: destroyed, gardening, iceplant, manila, nest, pest, Philippines, pigeon, planters, plants, rain, rainy day, spikemoss, succulent | Permalink.